Chad Lyman Weapons For Defense Ad (Final) from BJJ Fanatics on Vimeo. Our Kruger PR-32 Flashlight And Mueller AX-320 Tactical Pen Knife + Chad Lyman's “The Self Defense Flashlight” and “Ultimate Guide To Using Weapons For Self Defense” DVDs Are the Final Pieces You Need In Your Arsenal! These situations can happen in the blink of an eye. A walk back to your car after a nice dinner or a movie can quickly turn into a life or death situation. If you are serious about protecting yourself or your loved ones from an attack you need to prepare for a lot of scenarios. Chad Lyman is a BJJ Black belt and he teaches the art at the world famous Xtreme Couture in Las Vegas. He is also a grizzled veteran police officer with hundreds of arrests and S.W.A.T. team raids under his belt. He's not the cop who works in the boondocks and thinks busting some high school kids for drinking is a big deal - he literally deals with life and death all the time in Las Vegas - one of America's worst crime cities. Do you know what Chad’s first weapon of choice is? It’s this tiny pocket flashlight. Then he started showing us his routine and our jaws dropped. and has gotten an angle, when it comes time to strike, he uses the light in his hand like a roll of quarters to add multiples of force to his punches. He also uses the specially installed bevels on the end of the light to bludgeon opponents. When Chad hammer strikes the bevels act as teeth and will open any opponent to require lots of stitches with each blow. The light can come with you anywhere - even on a plane - as the bevel screws off before inspection. Always check local laws but, as far as we know, these lights are legal anywhere. 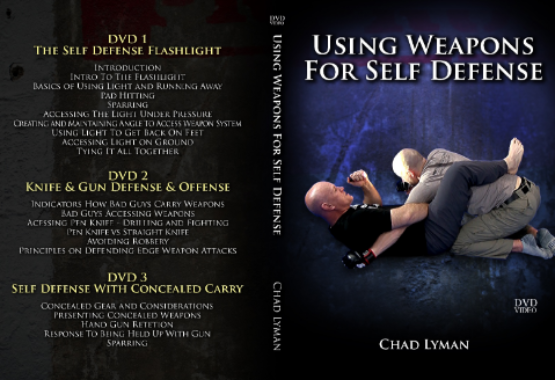 That’s why we include Chad’s “Flashlight Self Defense” DVD. Chad will show you how to best utilize the flashlight. Remember- this isn't for a 1 on 1 confrontation where you know you can handle yourself. The flashlight and instructional DVD are for when you are the victim of a crime: meaning a substantially bigger or more able attacker, multiple attackers, or when an attacker(s) have weapons. After you receive Chad's instruction seriously injuring, cutting or killing someone isn't far-fetched. And if it’s a case of some thug’s life vs. your life or the lives of your family – don’t you want to be fully prepared? The Kruger PR 32 is 4” long, which fits perfectly in your fist like a heavy roll of quarters. It also has a thumb activated light button on one end and a 500 lumen light at the other - bright enough to stun an attacker but not so bright that the reflection will bother you. Others will try to sell you 1000 lumen lights but as Chad will explain in the DVD… you don’t want those. The reflection can be damaging to you. It is made from a tough aluminum that will hold up to most any wear and tear that you can dish out and also tear apart any attacker's face. The pen knife is another inconspicuous weapon that you can carry anywhere without raising any red flags. However, when it's time to use it… it's even more deadly than the flashlight. The Mueller AX 320 is a real pen that writes, but when you turn it around it is a brutally sharp 6" steel reinforced shank that will plunge into any attacker and maim or kill him quickly with a hammer strike. There are ridges on the side so it doesn't get stuck in an opponent, and a comfortable resting spot for your thumb on top of the pen. Again, this weapon is for life and death situations only - as it is quite deadly. As far as we know it is legal everywhere but always check local laws. 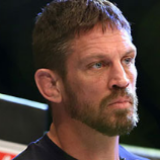 "Chad has been training and competing in BJJ/MMA for over 17 years. He has competed on a sport level and protected himself and the community as a police officer. Chad has been coaching and teaching others how to compete and defend themselves for many years. Through getting to know Chad, I know he coaches in gyms and also at the police department. As a competitor, coach, and promoter I know that training the way Chad has over the years has given him an excellent base of knowledge to understand how fights are won and lost." "As a former state champion wrestler, current high school wrestling coach, Defensive Tactics Instructor for the largest law enforcement agency in Nevada, and lifetime participant in combative athletics, I can personally attest to Chad’s expertise of the disciplines in MMA (Grappling, Boxing, Muay Thai, BJJ, Judo, Wrestling, etc)." Well, what is it worth to learn the secrets to protecting you and your family against an unprovoked street attack – no matter the odds? 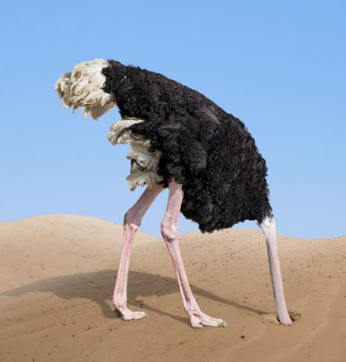 This is one of the most groundbreaking programs on the market. You aren’t just getting 2 legal and lethal weapons – you’re getting the necessary instructionals on how to use them! 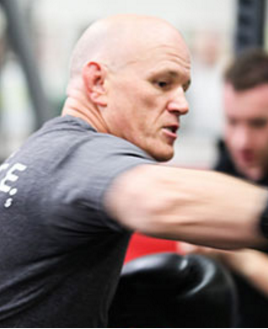 Renowned self-defense trainer and MMA coach Chad Lyman is going to draw back the curtain and let you in on the secrets he’s perfected through the years. If you wanted to get a personal instruction from Chad… well, good luck with that. He’s busy keeping the streets of Las Vegas safe for the rest of us, and between that and his other responsibilities he just doesn’t have the additional time. That’s why we’re so excited that we were able to get him on film talking about his tricks and techniques. How much would you expect to pay for this kind of learning (and possibly life-saving) experience? We could easily have charged $197 and it would have been a bargain. But we’re not going to do that. Instead, cut that price by more than 60%! There’s no reason not to take action. This package will change your life - Guaranteed. If you don't like it for any reason just send it back for a full refund... no questions asked. 30-day No Questions 100% Money Back Guarantee. Claim your set right now with ZERO RISK, watch the videos, then decide if you want to keep them. If you miss out, you’ll be sorry. So click the button below right now, and we’ll ship your package right out to you.